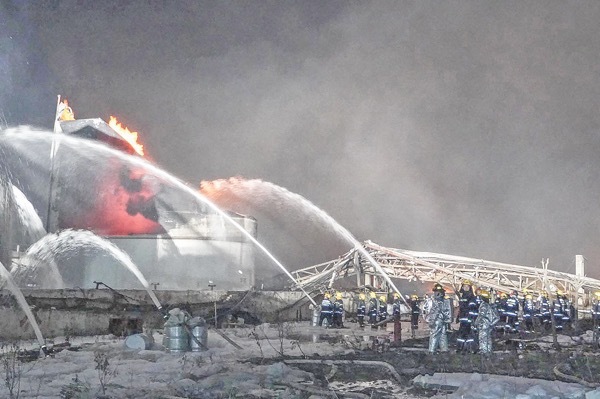 YANCHENG (China): Chinese President Xi Jinping ordered local governments yesterday to prevent any more industrial disasters after a chemical plant blast left 47 people dead, injured hundreds and flattened an industrial park in the latest such catastrophe to hit the country. Thursday’s explosion in the eastern city of Yancheng, Jiangsu province was one of the worst industrial disasters to hit China, with Xi acknowledging that the country has seen a rash of major accidents in recent years. Xi – who is on a state visit to Italy – urged “all-out efforts” to rescue those trapped and to identify the cause of the accident “as early as possible”, according to the official news agency Xinhua. The State Council, China’s cabinet, has established a team to investigate the explosion, state media said. Local authorities, who are investigating the cause of the accident, said an unspecified number of people were taken into police custody yesterday. According to a report released yesterday by Jiangsu province’s ecology and environment department, several rivers near the blast site are contaminated with chemicals, including chloroform and dichloromethane. The force of the explosion – which was so powerful that it apparently triggered a small earthquake – blew out windows and dented metal garage doors of buildings as far as four kilometres from the site. Nearby residents – many of them elderly – have started sweeping up glass, and in some cases, seemed to have abandoned their homes entirely. Black smoke could still be seen rising from the chemical plant yesterday morning before dissipating. “I have no one to help me here,” said a grandmother and single mom surnamed Wang. “What am I going to do with all the shattered glass on the floor and a broken wall?” the 57-year-old asked, tearing up. Firefighters extinguished the blaze yesterday after battling raging flames through the night. Three chemical tanks and five other areas had been on fire. China probes blast as death toll rises to 47 0 out of 5 based on 0 ratings. 0 user reviews.